Accra, Oct. 25, GNA – Professor Kwabena Frimpong-Boateng, Minister for Minister for Environment, Science, Technology and Innovation (MESTI) Thursday tasked Science teachers to design experiments that students can perform to transform theoretical Science studies into practical life. This, he said, would make students become more innovative and problem solvers upon leaving school. They should at least be able to estimate time, distance, volume, height, among other things, that would aid in tackling the daily problems of citizens. Prof Frimpong-Boateng made the recommendation in Accra, on Thursday, when the Founders of the Science Set by the Dext Technologies, (a Ghanaian start-up technology company under the mentorship of the Ghana-India Kofi Annan Centre of Excellence) presented an African Union Award they won, in Senegal, to him. Science Set is a portable, syllabus compliant, scalable science laboratory designed to enable students to carry out experiment in the classroom or anywhere without having to go to the traditional laboratory. He explained that no nation would thrive without putting innovation and ideas into practice, thus the need to train students to be innovative. The Minister said Ghana was ranked the 41st in terms of population but was the 147th when it came to Human Resource Development, which measured Education, Income and Life Expectancy, among others. President Nana Addo Dankwa Akufo-Addo, the Minister said, was interested in Science, Technology, Engineering and Mathematical (STEM) , therefore, through MESTI and the Ministry of Education, students would be trained to handle such subjects to advance national development. He commended Charles Ofori Antipem and Michael Asante-Afrifa, the founders Dext Technologies for not only raising the name of Ghana high but also being innovative. This would enhance teaching and learning of STEM, which had always seen to be abstract, as the components would guide students, he explained. “With this Ghana is set to change for the better,” he said. 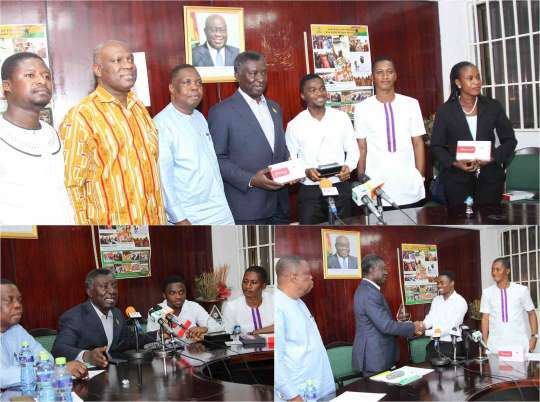 He urged Ghanaians, especially alumni bodies to help resource their alma-mater, with the Science Set to complement the Government’s efforts in giving free education to students. Dr Yaw Osei Adutwum, a Deputy Minister of Education said, making students innovative would help in job creation after school and it would lay the foundation for national socio-economic growth. It would also help nurture engineers , among other relevant professionals, who were in high demand by companies to stop the situation of recruiting them from outside the country, he said. He said as the youth had brought Ghana’s innovation to global standards, parents, Members of Parliament, District Assemblies should support the good cause by getting them in schools. The user friendly set, he said, would help give practical concrete experience as well as give evolution to theory, adding that it was the best way to teach and learn Science. He encouraged the youth to emulate as that was the only way to aid Ghana’s development. The winners were accompanied by Mr Tony Kofi Adu Gyau, Director General of Ghana-India Kofi Annan Centre of Excellence in ICT. Mr Ofori, explaining the function of the Science Set said, the electronic device had 45 components, which helped to perform practical step activities in the classroom and it was also easy for teachers to use. The GH¢120.00 Set has a magnifying glass, transistors, iron filings and more, which would help learners from the Basic and Senior High Schools to study Science with ease, he added. He thanked Prof Frimpong-Boateng for recommending the device, which won the AU’s most Innovative Educative Solution in Africa, this month. It has also received awards from the American Society for Mechanical Engineers; Royal Academy; the Ghana Institute of Engineers’ among others.